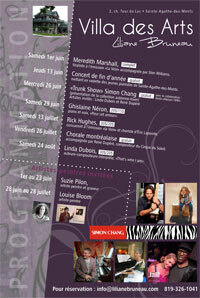 Liliane Bruneau has always been passionate about the arts. 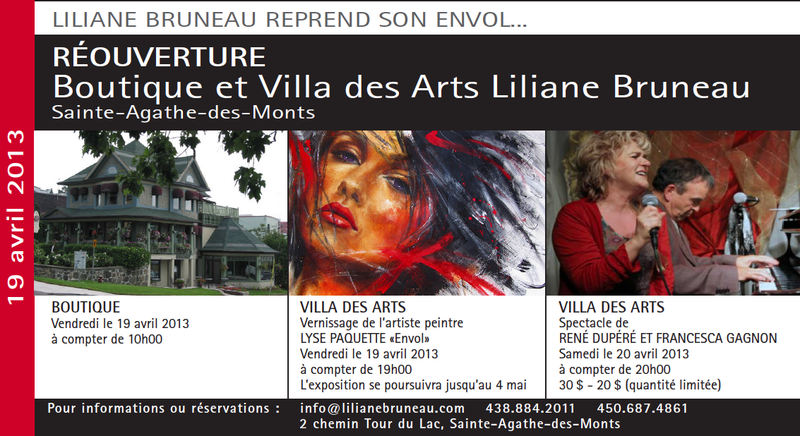 In 2001, she inaugurated Villa des Arts, a gallery showcasing Québec painters. In 2004, with the precious collaboration of Louis Pelletier, a specialist in Québec heritage, she added to her art gallery a magnificent Victorian pavilion to be used as a show hall. One of her dreams was finally realized: the coexistence of fashion, art and music and the conception of new and exciting events in a creative environment. This small show hall, adorned with magnificent paintings, hosts several concerts and can hold up to 70 privileged people.